Flatliners finally gave us the pairing everyone had been waiting for: Joel Schumacher of Batman and Robin and Kevin Bacon from those Kevin Bacon adverts. Eat your heart out Scorsese and De Niro. It follows a group of easy-to-hate twentysomethings at med school who clearly need a lesson in medical ethics. They find a way to die and be brought back to life, which they all experience one by one. Dying turns out not to be as great they expected, however, as they become eerily haunted by their respective pasts and assorted creepy mumbo jumbo. The religious symbolism is stretched to breaking point with a grand, gothic med school that looks like a church. All the “flatlining” scenes look like they’re in the Sistine Chapel, which is probably supposed to be creepy but just looks weird. You don’t know if they’re attempting a complex medical procedure or electing a new pope. This dramatic, over-the-top setting makes it look like every other overly serious, trashy, quasi-religious horror film like End of Days, Drag Me to Hell and The Box, although it’s nowhere near as bad as the latter two. The religious imagery is stretched so far they even make Kiefer Sutherland look like Aled Jones, presumably to remind the audience of Songs of Praise, which is enough to send a shiver down anyone’s spine. The death/dream sequences miss a great opportunity to do something weird or unusual and are instead boring. This pretty much sums up the film, which has nowhere to go with its initial premise. As each of the gang go through the procedure it gets repetitive, and is very thin on explanation. It’s also one of those really annoying “let’s prove the sceptic wrong” films. “How do you explain the similarity in death experiences all over the world?” Julia Roberts’ “Dr” Rachel Mannus opines at Bacon’s atheist character. Checkmate, Mr Atheist! A minuscule number of people that have survived coming close to death vaguely say something about a white light! How do you explain that?? It must be Jesus, you ninny! Before it finishes there’s some vague stuff about karma and atoning for your past which leaves you wishing Kevin Bacon would atone for this film. And that Kevin Bacon advert. Is it ruined by that Kevin Bacon advert? No. It’s ruined by itself. Bacon turns out one of the better performances, and the fact that we never actually see “Flatliners Bacon” in that Kevin Bacon advert means this doesn’t ring too many bells. 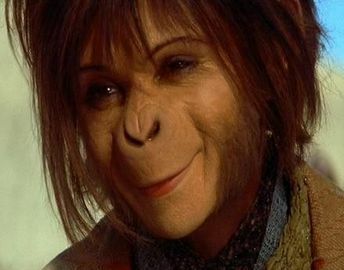 Also, Bacon looks more like Helena Bonham-Carter in Planet of the Apes in this, so memories of the ad are minimal. No. If you’re a fan of that Kevin Bacon advert, there’s not much here for you, with Flatliners Bacon hardly featuring in the ad. It’s also a pretty bad film, so even if you’re not familiar with Kevin Bacon’s previous work on that Kevin Bacon advert, you should probably give it a miss. Maybe stay in and try some auto asphyxiation instead.